I spent over two years using a fat clamshell phone with glittery rainbow and penguin stickers on it. This would not be surprising if I was a 14 year old girl. But I was that girl’s older brother. Aside from the stickers and clunky interface, the phone only had space for approximately 5 text messages (making me constantly have to delete messages to get new ones). However, the camera seemed to miraculously circumvent this limitation, as evidenced by at least 200 dark photos taken of the inside of my pocket. The reason I subjected myself to this is not for some kind of comedic irony (as a known technophile, regularly comparing my Ericcson brick phone with the circle of iPhones I am generally surrounded with), but rather because I just didn’t see any phones come out during those two and a half years that were worth investing in. And I’m not just talking about a financial investment (though that is significant as well). There are also mental and temporal investments. I have to learn how the phone works, get used to its strengths and flaws, and set everything up just how I want it. On top of that, I have to invest time learning which apps are best and getting them to work properly. And up until recently, I didn’t see any phone that was worth the money and effort for me. 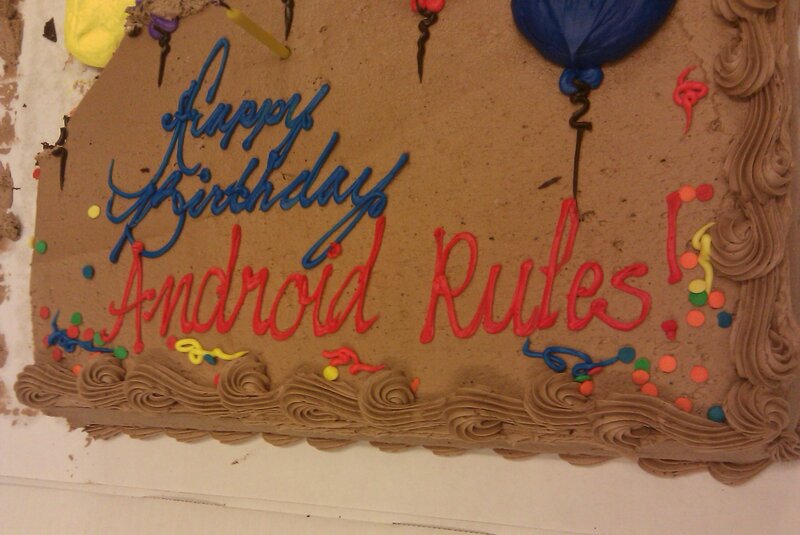 My labmates seemed to think this was the most appropriate message for my birthday cake. Clearly they know me very well. Android is an operating system, like Windows or OS X on computers, but designed specifically for use on small devices (such as phones or even microwaves). It will probably be turning up on a lot more devices in the near future. Android is open source, meaning anyone can download the full source code and modify it for free. This makes it attractive for hardware manufacturers as it increases their overall margins on a device. This is comparable to what is happening with open source operating systems on computers (like Ubuntu or Google’s Chrome OS). However, while computer operating systems have been developed for decades, advanced smart phone operating systems are still at the nascent stages of design and features offerings. It’s thus much easier for an open source alternative to actually compete and grab market share from established systems much faster (people aren’t as committed to phone operating systems as many are to Windows, for example). Android is not a phone made by Motorola and sold by Verizon. The Droid phone runs the Android operating system, but the phone itself is not made by Google. An analogy would be a computer (phone) made by Dell (Motorola) that runs the Windows (Android) operating system. It’s open | This has a few advantages. First, it’s free (ultimately reducing the bottom line on phones). But beyond that, it is able to grow with fairly rapid development cycles. Additionally, third party software is not regulated like it is on some fascist phones, leading to more creative and compelling applications. Shady policies surrounding software moderation are even driving developers to quit the iPhone. It unifies my phone-to-phone experience | It used to be that the only thing you cared about carrying over from one phone to the next was your contacts (and even this wasn’t a given – hence the many requests you see from people who have suddenly lost their address books). But now you’d like to switch to a new phone and be able to easily port your contacts, photos, text messages, applications, and other settings. If you lock yourself into a walled operating system and at some point you want to move to a cooler phone with a different OS, you’re basically out of luck. But since Android is being implemented on tons of phones now, from every carrier, you can readily jump from handset to handset while preserving your basic user experience and data. Google even plans to integrate a settings backup/restore feature to be implemented in the near future. It’s backed by Google | And Google is awesome. They encourage optimal user experience in an array of applications. Almost every important application I use these days is improved by Google’s forward-thinking designs. And although some people are concerned about Google owning too much of our digital lives, I personally believe Google doesn’t intend to do any evil, and they’ve made some good strides for openness and data portability. Google is definitely in a strong position to revolutionize the mobile phone industry. It is well-designed | Sure, some of it is just eye candy, but the Android interfaces are really aesthetically pleasing and generally intuitive to manipulate. It also facilitates an unprecedented amount of customization of user experience. It’s an efficient and enjoyable OS to interact with. Yet, even with all of the clear benefits of moving towards an Android operating system, I passed on the earlier iterations of the G1 and MyTouch. It wasn’t until the HTC Hero launched that I was finally ready to make my investment. The launch of the Hero was regarded by many as the first real competition for the iPhone in terms of performance and functionality. While previous Android phones were still a bit buggy and suffered from issues with battery life, speed, and basic functionality as a phone, HTC really built an excellent phone here. This phone also marked the introduction of HTC’s Sense UI, which is basically a modification of the Android OS to improve the user experience with some additional customization options. All in all, the hardware was finally there. On top of this, I was surprised to find how appealing the actual carrier was in this instance. The Hero was the first Android phone launched on the Sprint network in the US. I had always used AT&T as my carrier (except for the brief period when it became Cingular and then eventually reverted back). And Sprint was actually really cheap! From some basic searching online, I discovered Sprint will give a discount to pretty much anyone with an organization email address. You just enter your email address at this site and they’ll send you a link to your “Private Sprint Store”. 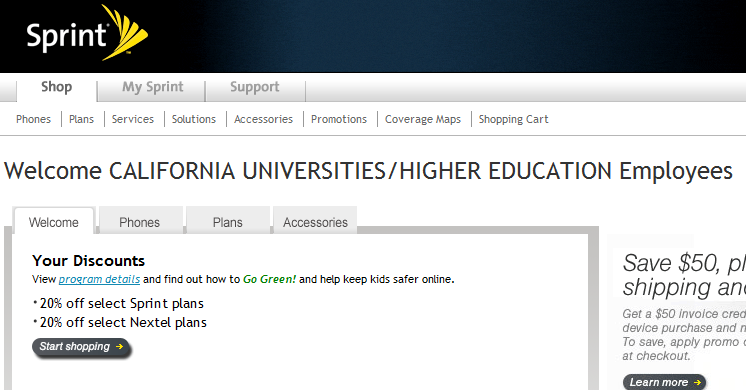 The specific rates vary, but for Berkeley this amounted to a 20% discount on plans! So this made the $69.99 unlimited plan (unlimited calls to any phone, unlimited data, and unlimited texts) just $56/month (about half what it would cost to get a similar plan with AT&T or Verizon). On top of that, I’ve anecdotally found the Sprint network to be really dependable in the areas where I’ve used it (Berkeley, San Francisco, Boston, Maryland, DC), and I seem to get better coverage than I used to with AT&T. So this helped push me over the edge with the Hero. So it’s about time I get to the title of this post. There are a few issues I’ve run into with this phone, but perhaps the most significant one is that of OS branching. Basically, since Android is open source, third parties can modify the core code that Google originally wrote to add specific functionality. This is like particular distributions of Linux that are modified to function/look a certain way (such as Ubuntu). In fact, Android itself is a particular distribution of the Linux kernel. So in the case of the Hero, HTC has modified the core Android code to implement it’s “Sense” UI. This has likely improved the user experience, though I haven’t played with other android phones (but I have friends using the Motorola Droid who seem to like my phone better specifically because of this UI enhancement). The downside is that now I have a very special version of Android that has to be specially modified any time there are core upgrades to the Android OS (which have been coming rather frequently with the a new version seemingly released with each new phone). When I got the Hero, the most up-to-date version of Android was 1.5 (also known as Cupcake, in Google’s line of dessert-inspired names). It was very quickly upgraded to 1.6 (Donut), but I wasn’t able to make this upgrade on my phone because of the modifications HTC made to the OS (without rooting my phone, voiding warranties, etc.). 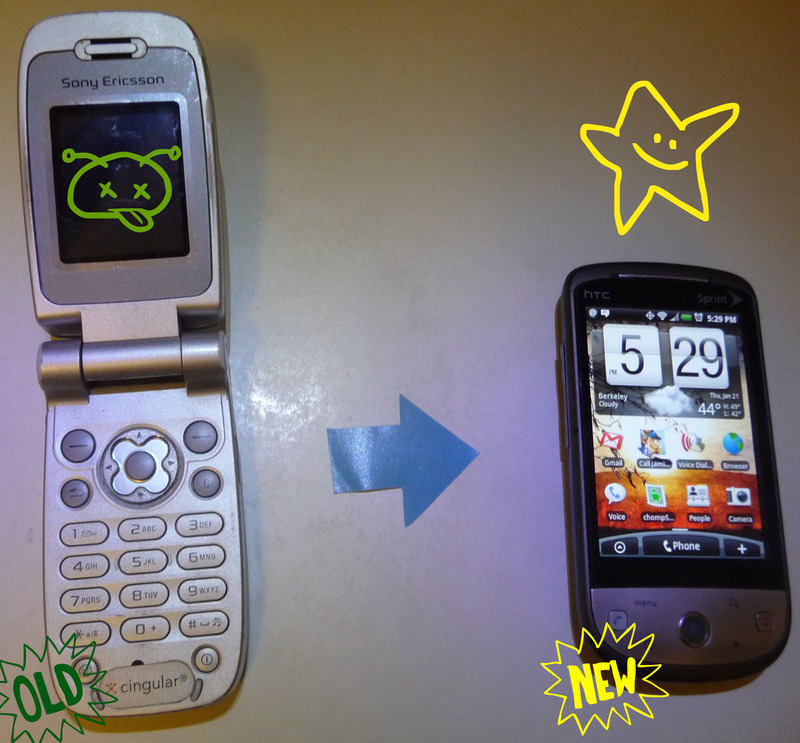 Sprint announced an upcoming upgrade to 1.6, but then the Droid came out with 2.0 and the timeline for release has gradually moved back to the point where Spring has now said we’ll skip 1.6 and jump straight to 2.1, sometime in the first half of 2010. That could be June. And by then, 2.5 or 3.0 might be released. So the upgrade cycle definitely lags thanks to OS branching. Hopefully these sorts of delays will be reduced by adjustments to the core Android platform in the future (and as more phones offer the “full” Google experience), but for now you just have to be satisfied with the phone as it is when you buy it, knowing its OS could be obsolete in a matter of weeks. And I’m definitely satisfied with my Hero, so Android limbo isn’t so bad afterall.